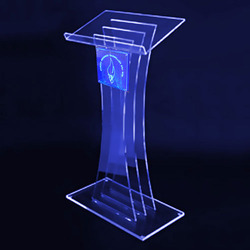 We are the trader and distributor of gamut of beautifully designed Acrylic Podium. 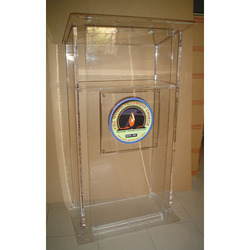 We provide our clients with durable and qualitative acrylic podium at reasonable prices. 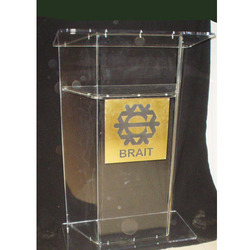 Our range of acrylic podiums and plexiglass podiums are stylish, durable and lightweight that enable easy handling. Elegance addressing while Acrylic Podiums / Lecterns. 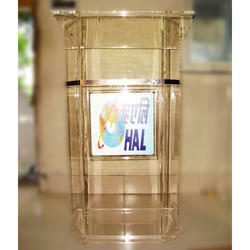 World wide famous Acrylic Podiums manufactured by Medha Acrylic Engineering. Made of very fine Acrylic. Podiums are a life long investment. Lighted logos are also available on Podiums. 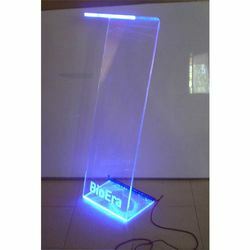 Our organization holds the specialization in the manufacturing and trading of optimum quality Acrylic Plexiglass Podium to the esteemed clients. These podiums are precisely manufactured under strict supervision with the incorporation of cutting-edge technology and excellent quality craftsmanship. Appreciated for their attractive design, elegant finish and cost-effectiveness, these podiums are highly demanded by our clients. 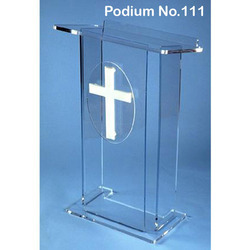 Owing to our rich industry experience, we have been able to offer supreme quality Acrylic Lectern Podium at our prestigious customers. These podiums are manufactured in compliance with industry set parameters, under strict supervision of qualified professionals. Our offered podiums are widely appreciated for their durability, seamless finish and elegant design. 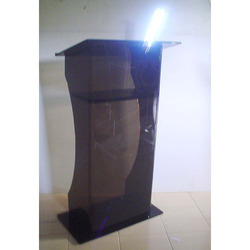 Moreover, we offer these podiums in multiple colors. 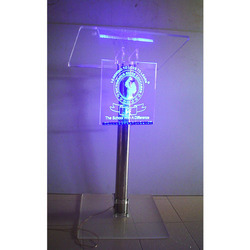 We are instrumental in the manufacturing and trading of high quality Z Design Acrylic Lectern to the honored customers. 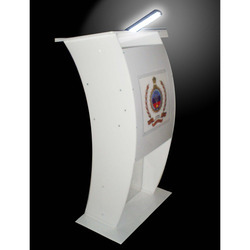 These lectern are manufactured under proper supervision using latest market trend and designs. 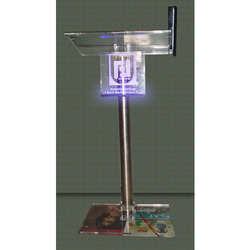 Offered Z shaped lectern are extensively demanded in offices, conference rooms and educational institutes. 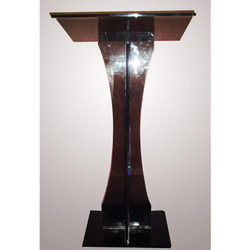 Our lectern are acknowledged by the clients for their unmatched quality and classy finish. The incorporation of best quality raw material, cutting-edge technology and excellent quality craftsmanship, we have been able to offer premium quality White Acrylic Podium. These podiums are widely appreciated by the clients for their classy finish, attractive design and light weight body construction. 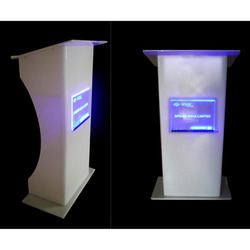 Moreover, we offer these podiums in four different colors. We are listed among the leading manufacturers and traders of premium quality Butter Fly Podium. Owing to their elegant finish, attractive design and light weight, offered podiums are widely demanded in schools, colleges, offices, amphitheaters and trade shows. 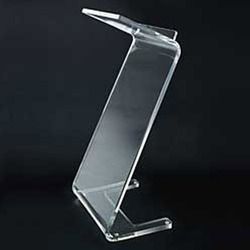 We offer these cost-effective podiums in four different colors. Owing to the domain expertise and helping hands of our professionals, we have been able to manufacture and supply optimum quality Criss Cross Podium. 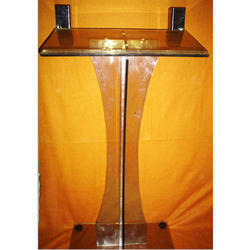 These podiums are manufactured by efficient manufacturing team using good quality raw materials and latest technology. Offered podiums are widely appreciated among the clients for their classy look and fine finishing.